The 28-page National Intellectual Property Policy of India is available here. The official press release is here. The new policy was released Department of Industrial Policy & Promotion, Ministry of Commerce & Industry, Government of India (DIPP), of the Ministry of Commerce and Industry. A key aim of the policy is to get India to generate more IP rights. Finance Minister Arun Jaitley said today that the IPR policy is compliant with World Trade Organization. A video of his announcement of the new policy, along with highlights of his remarks, is available here. Earlier, health activists had expressed concern about what they call an over-emphasis on IP enforcement. 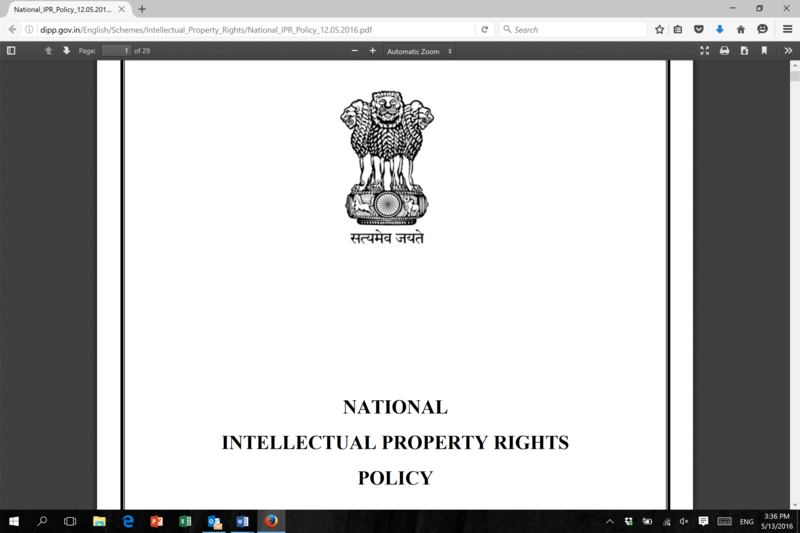 "India Releases New Intellectual Property Policy; Reactions Building" by Intellectual Property Watch is licensed under a Creative Commons Attribution-NonCommercial-ShareAlike 4.0 International License.